Andrew Hartman and Still Motion will be celebrating the release of their debut CD Andrew Hartman and Still Motion at Ruby Tuesday, 1978 Summit Street in Columbus, OH on Friday April 30 at 11:00 PM. The band will perform repertoire that ranges from modern jazz to arrangements of rock and pop material, as well as selections from their new album. 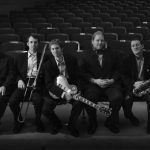 The musicians in Still Motion have considerable performance experience, having played throughout the world with renowned jazz artists and organizations including DD Jackson, Billy Hart, Byron Stripling, the Columbus Jazz Orchestra, and many others. The band and album feature Michael Cox on tenor and soprano saxophone, Ryan Hamilton on trombone, Andy Woodson on electric bass, Chris Guthrie on drums and Andrew Hartman on guitar. Andrew Hartman and Still Motion is comprised entirely of Hartman’s original compositions. The CD has received airplay on Jazz Sunday with KC Jones, Jack Marchbanks and Gail Burkholder at WCBE radio (90.5 FM). The album is currently available for purchase at http://www.ajhmusic.com as well as on iTunes, and CD Baby (CD Baby). Joining Still Motion on the April 30 show will be the New Basics Brass Band which will kick off the evening’s music beginning at 9:00 PM. Admission for the entire evening is $5 (cash) at the door and is open to those ages 18 and older ($7, ages 18 – 20).